Free Chapter - Say It Now! Say It Right! Be honest. If you have employees, you have communication issues. People who don't speak up and share ideas in meetings. Rooms full of "yes" people, where no one feels safe to disagree or offer an opposing opinion. Meetings where people who have the most knowledge of a problem aren't in the room...and have no voice. Get those straight, and you have solutions to a toxic work environment with broken communications. You and your team can learn how to stop losing money, time, ideas and talent! Using proven principles, practices, and techniques, you can start fixing what is broken. In SAY IT NOW! SAY IT RIGHT! Mary J. Nestor provides practical solutions and real life stories to help you and your team know when to speak up and how to do it the right way. SAY IT NOW! and SAY IT RIGHT! Say It Now! Say It Right! should be required reading for CEOs, leaders, managers… anyone who has ever hesitated to speak up in critical moments in business, relationships, and life. You will dramatically improve your influence, impact, and income when you learn to SAY IT NOW! and SAY IT RIGHT! David Newman, author of "Do It! Marketing"
This brilliant book is a communication roadmap to strategically guide you from where you are to where you want to be. Do you want healthy, supportive relationships wherein everyone feels safe enough to express their needs in a clear, concise and respectful way? Then buy this book. In fact, buy several copies so you can share it with people you love and/or work with. Watch everyone’s life transform for the better! 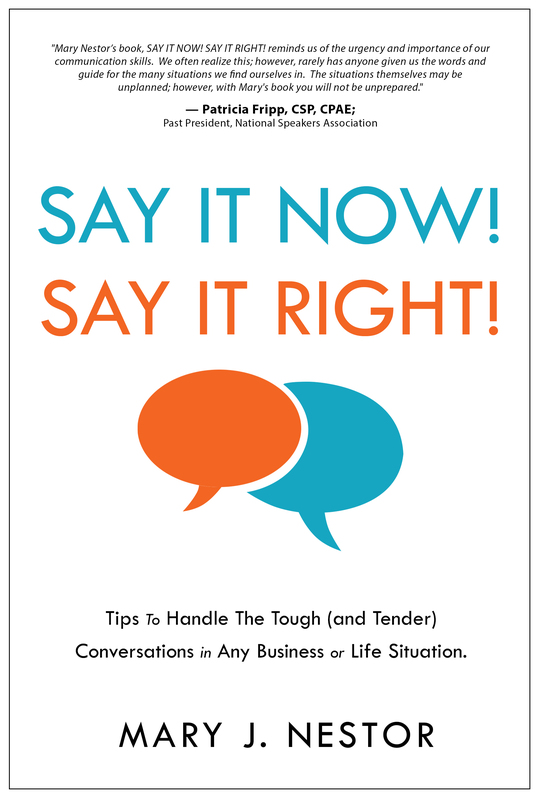 This fast-moving, entertaining book gives you exact words to say to feel confident and in control of any conversation. It's time someone spoke out on speaking up! Read this book and turn up your volume for success now! !